CRE Tech, Inc., developer of the popular commercial real estate app TheAnalyst® PRO, announces a partnership with the Northern California Commercial Association of REALTORS® (NCCAR). The collaboration involves CRE Tech co-branding its flagship product, TheAnalyst® PRO app, and offering it to NCCAR’s members at a contracted discount subscription price. This arrangement allows NCCAR to gain another attractive membership benefit, while expanding CRE Tech’s footprint of TheAnalyst® PRO to a large group of active real estate practitioners. TheAnalyst® PRO app is a comprehensive toolkit for real estate practitioners. The robust app provides financial calculators, investment analysis reports, mapping tools, location and environmental risk analysis, training videos and more, easily accessible via mobile devices and office desktops. CRE Tech, Inc., specializes in developing and licensing technology and marketing products. 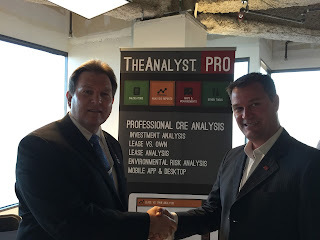 Creators of the award-winning TheAnalyst® PRO app (https://TheAnalystPRO.com), CRE Tech works with regional, national and global real estate firms and associations to provide technology solutions. CRE Tech excels in bringing together client vision with technology that jettisons their marketing and tech strategy to the next level. Learn more about CRE Tech, Inc., at http://www.CREtm.com. The Northern California Commercial Association of REALTORS® (NCCAR) coordinates education, information, networking and public policy for the benefit of its members. Membership is made up of real estate practitioners specializing in commercial real estate services and dedicated to serving the needs of commercial clients in aspects of commercial sales, investments, leasing, appraising, property management, and development. For more information, please visit http://www.nccar.org.